A great cast as long as they're nowhere near moving vehicles. I'm looking at you Cuba Gooding Jr. in Boat Trip, you Nia Long in Are We There Yet along with Ice Cube who was also awful on a boat in Anaconda and a bike in Torque. For Angela Basset it was spaceships in both Supernova and Critters 4. A train ride caught Morris Chestnut unless you're a big Under Siege 2 fan. Only Lawrence Fishburne went unscathed who whether by sea in Apocalypse Now or space in Event Horizon isn't tainted by travel. simple story but emotionally intense film. with a good soundtrack and 90's west coast atmosphere, it's one of the referenced examples of "hood film", together with "do the right thing". i think "furious" reflects the main idea of the film. the government tries to destroy unwanted people by forcing them to being uneducated and unemployed. this method will cause to increase violence and terror among these groups. eventually the power will confirm itself and will demand right to intervene. I thought I was watching my first Spike Lee right up until the credits rolled. Huh. Regardless of who I thought directed it, it was a good movie that feels completely relevant and barely dated at all 30 years later. 19th film of 2018. 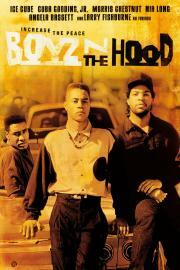 Boyz n the Hood is essential viewing, and while it is difficult to watch at times, the film leaves a powerful mark.